1. Babies inside the womb can differentiate light and dark. At around week 16 of gestation, the babies’ eyes are already able to sense the presence of light. Beginning week 26 up to week 28, they start to open and close their eyes and do this regularly all throughout pregnancy. Though considered a “blurry vision”, babies can “see” while inside the womb and may respond when their mom’s belly is exposed to bright sources of light. 2. Newborn babies don’t know how to use their eyes. Normally, infants are born with each eye having the complete physical structure and capability to see but they are yet to discover how to use their eyes together. It will take a few more weeks before newborns would get used to their “binocular vision”. 3. Babies can recognize colors a few days after birth. Contrary to beliefs that newborns can only see things in black and white, a recent study on colors conducted by Anna Franklin of the University of Sussex in England suggests that they are able to see colors a few days after birth. The study indicates that newly born babies may have limited color vision and are still unable to fully distinguish various colors except for the color red. The result of Franklin’s study was reported in the May 23 Proceedings of the National Academy of Sciences. 4. Breastfed babies tend to have a better vision of childhood. Scientists have found that breast milk has high DHA (docosahexaenoic acid) concentrations as compared to infant formula milk. DHA plays a major role in enhancing the developing eyesight of younger children. Isn’t it amazing to know that young infants already practice their visual skills at an early age? As parents, we should do our part to improve their sense of sight and help them achieve their optimum vision. 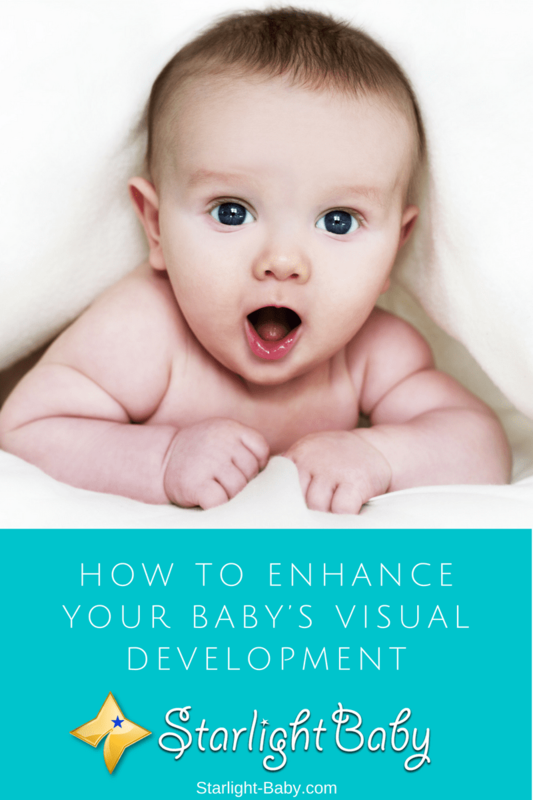 Below are a few of the best experts’ advice on enhancing your baby’s visual development. 1. Have sufficient outdoor exposure while pregnant. As we’ve learned earlier, your baby already responds to the presence of light, even if they are still inside the womb. Going outdoors often would help offer stimulation to your baby’s sense of light and darkness. This is one of the primary skills that your baby will learn with regards to their vision. Experts suggest that the exposure may further help the baby’s eye development and may reduce the risk of developing eye disorders. 2. Promote eye-to-eye contact with your baby especially during the first few weeks of their life. Doing this will not only help your baby practice their visual acuity, it can also be a good time to bond with your little one. Newborn babies often seem to be fascinated with faces. When you see your little one looking at you intently, it means he is trying to focus on your face and it is also a good indication that your baby recognizes you. When making eye-to-eye contact, it is important to note that newborns can only focus their eyes at a distance of around 8 to 12 inches, so better make sure you are within those parameters when smiling or talking to your baby. 3. Decorate your nursery with bold, geometric patterns. Your baby’s nursery will be their primary surroundings for the early days of their life, thus, it is important to incorporate some visually-stimulating decors within the room. Bold, geometric patterns are easier to see from an infant’s point of view, be it in a form of wallpaper, bedding or crib toys. 4. Get playful with colors. Restricting your baby’s environment to black and white is old-school and recent study suggests that babies can already recognize colors at a very young age. Experts say that infants seem to see the color red first, but will eventually wander through a variety of colors in a few more weeks. Get playful with introducing new colors to your baby. Who knows? Your little one might already be a fan of orange, green, or violet. 5. Offer activities to stimulate your baby’s hand-eye coordination. Beginning 4 months of age, you may notice your baby attempting to reach for objects he sees. This is a significant indication of the development of their hand-eye coordination. You can enhance this skill by placing some dangling toys over the crib or stroller. Showing a rattle and allowing him to reach for it is also better than directly handing it over to your baby. As mentioned above, DHA in breast milk plays a major role in keeping your baby’s eyes healthy. If breastfeeding isn’t possible, you may opt for some DHA-fortified formula for your infant. 7. Change your baby’s position frequently. To look at the same spot for the entire day or week would be boring, and yes, babies do get bored as well! Changing your baby’s position in the crib, alternating sides, while feeding your baby, and moving their crib at several locations in the room, are good ways to provide some interesting things to see for your little one. Or better yet, enjoy an early morning sun in the backyard or stroll at a safe place nearby and let your baby’s eyes indulge in the beauty of nature. 8. Bring your baby for an eye check-up shortly after birth. A pediatrician or a licensed eye doctor can help you assess the overall health and development of your baby’s eyes. Having a regular eye check-up also ensures that your baby will receive prompt intervention should there be any problems with their developing vision. Having optimum eyesight is important for babies because this is one of the primary senses that they will use to learn other skills later on in life. Doing these simple things will help keep your baby’s eyes healthy, and enhance their visual development. Exposure in outdoor activities is a sure good way to engaging baby’s vision, but caution must be taken not to overdo it because of how sensitive and fragile the baby still is at such early ages of their life on earth. Take care with exposing them to too much light as it would have negative effects on their sight and vision. Breastfeeding and getting comfortable with color introduction with the nursery is a very good way to start, as well as eye to eye contact. It goes a long way in getting the baby’s eyes capturing a unique picture and registering it in their young brain. Yes, I agree with everything you said, particularly about bringing a baby outdoors. Extra care should really be observed because too much of bright light may not be good for baby’s eyes. A baby should be introduced to the outdoors gradually. They are babies and this means that everything about them are still in its tender and delicate stage. So having them being pushed to too much light at a quicker rate would only do them damage than doing them any good. It’s taking time in getting them understand by doing it in a slow fashion. If you noticed, the babies when they are small hardly open their eyes well and all because it’s too bright for them. I am a new parent and some of the facts mentioned in the article are really new for me, for example, I did not know babies can differentiate light and dark even while in the womb. I learned about some of the points mentioned in the article gradually when my baby began growing up. I am surprised with the tip regarding decorating the nursery with the geometric pattern. I will have to reach more on this topic.